This Book is Sheer Entertainment! "Don't be in a hurry to grow up. Hold on to being a boy as long as you can, because once you lose that magic, you're always begging to find it again." Boy's Life will bring you back to every good memory of growing up. This book has a little of every genre, so hard to calssify. You will follow Cory through a pivotal year of his life, discover the mystery surrounding a murder and find yourself caught up in the imaginings of a young boy! 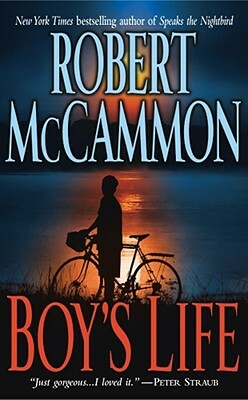 Don't miss the thrilling novel from #1 New York Times bestselling award-winning author Robert McCammon, in a book that Publishers Weekly calls "both a mystery that will satisfy the most finicky aficionado and a boisterous travelogue." Zephyr, Alabama, is an idyllic hometown for eleven-year-old Cory Mackenson--a place where monsters swim the river deep and friends are forever. Then, one cold spring morning, Cory and his father witness a car plunge into a lake--and a desperate rescue attempt brings his father face-to-face with a terrible vision of death that will haunt him forever. As Cory struggles to understand his father's pain, his eyes are slowly opened to the forces of good and evil that are manifested in Zephyr. From an ancient, mystical woman who can hear the dead and bewitch the living, to a violent clan of moonshiners, Cory must confront the secrets that hide in the shadows of his hometown--for his father's sanity and his own life hang in the balance.